When I first started spending my summers in Italy, I just went without a cell phone. It was weird but also liberating. Unfortunately (or fortunately? ), with each passing year we become more and more dependent on our cell phone. I mean it’s basically a handheld computer. I use my cell phone constantly when traveling, and most of the time it is a lifesaver. I can pull up records of reservations, call taxis, map my metro route, get directions, find restaurants, Instagram (of course), respond to emails, blog, and even fill Etsy orders. Travelling without my cell phone is simply no longer an option. Luckily, having a cell phone in Italy (and in most European countries) while you travel is no longer cost-prohibitive. 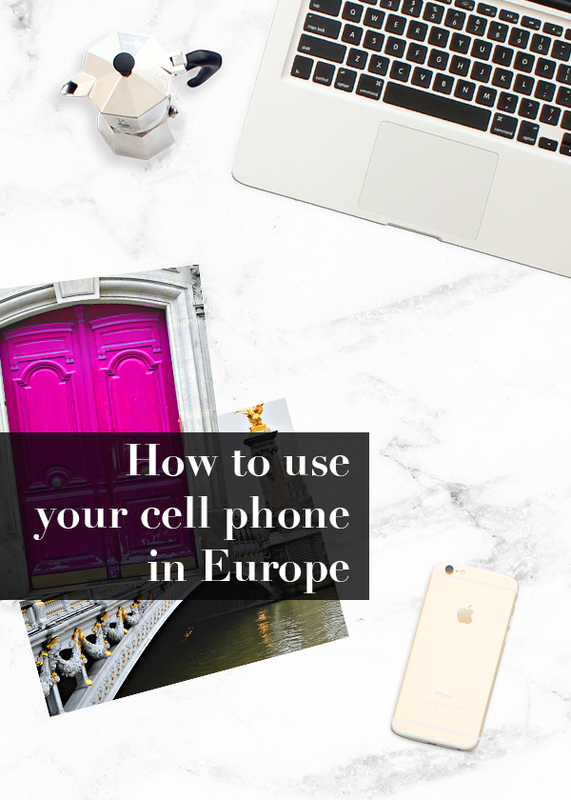 When it comes to having and using a cell phone abroad you have a couple options. The first, and most expensive, option is to contact your service provider back home and sign up for an international plan before departing. While this is convenient, it is pricey and you get little internet data, which means you will always be that American asking for Wi-Fi. Instead, I recommend the second option — purchasing an Italian SIM card (or a local SIM card for the country you are traveling in). Unlike the US, Italian SIMs are not tied to contracts. You simply pick a monthly plan (for 9 euros with Wind I get 250 texts, 250 minutes, and 1 GB of data and I pay an extra 3 euros for another 1 GB of data) and recharge your plan each month. Since there is no contract, if/when you run out of money on your phone, it simply stops working. So for 12 euros a month I have all of the data and minutes I need. This also means that you will have an Italian phone number, which is handy for taxis, hotels, car rentals, booking museums, etc. Buying a SIM card in Italy is easy. Just walk into one of the cell stores, TIM, Vodafone, and Wind are the biggest and most popular providers, and ask to purchase a SIM card. Pick a plan and they will even install it for you (just make sure you bring your passport). It is that simple! When you need to add money to your phone, you can simply go back to the store or walk into any tabaccaio (tobacco shop) and ask for a “ricarica.” Be sure you say who your provider is and how much money you want to put on the phone. They will enter your phone number into a little machine, and bam, your phone is recharged. This basically works the same way in most European countries. On my last trip to Paris, I purchased a tourist SIM with Orange. But what if you are also traveling to other European countries while abroad and don’t want to buy a SIM card in every country? Don’t worry the Italian carriers have promotions to cover the rest of Europe and vise versa. When I leave Italy, Wind charges me 2.5 euros a day for 50 calls, 50 texts, and 50 MB of data. If you want to call or text people back home, I recommend using Whatsap and Skype. But most Italian providers also offer plans that include cheap calls to the US. There is, however, one caveat. You need an unlocked phone to do this. Unlocking your US phone will depend on what kind of phone you have and your provider. For example, after two years AT&T will unlock your iPhone free of charge (unless you sign up for their new go plan). You will have to contact your provider for more specifics. You can also purchase a cheap “unsmart” phone in Italy or rent a basic phone from a student cellular provider like PicCell. But be warned, smart phones are very expensive here. I highly recommend traveling with a smartphone, especially if you are studying abroad. Having a local number and being able to search things on the fly is a lifesaver in a foreign city! I'm planning an upcoming trip to Europe soon! Just the other day, I was wondering about SIM cards and this could not have come at a more perfect time!! Thanks for the informative post :)) btw I love your blog-your life looks like a dream! I'm actually traveling to Ireland for a few weeks in September and this was super helpful! I'm hoping that Verizon will unlock my phone for me – their international plans are ridiculous. It is simply amazing place to visit, it reminds me of my holiday in Italy. I planned to visit that place after watching an Italy Travel Video that made me crazy and I decided to visit Italy. I think that This time i will plan to visit some other country of Europe. I was using my old phone in Europe from time to time, then I sold it here: http://klymen.com/. Haven't tried my new one in any trip yet, but hope there won't be any problem too. I have had great experiences. The food is great in all the countries you have mentioned. I live in Paris,France. If you need any help on choosing places to visit, don't hesitate.